The Federal Reserve decided to continue winding down its massive bond-buying program, following Ben Bernanke's final meeting as chairman of the central bank on Wednesday. In a move that was widely expected, the Fed said it will reduce its bond-buying program to $65 billion in February, down from $75 billion in January. The Fed had been purchasing $85 billion in bonds each month since September 2012 in an attempt to stimulate the economy. But it began reducing the program this month -- a process Wall Street has nicknamed "tapering." Officials were looking for improvement in the job market, and given unemployment has fallen over the last year, they decided there was enough "cumulative progress" to warrant a slowdown in stimulus. In an official statement, the Fed sounded more upbeat about the economy, noting the data since it last met in December "indicates that growth in economic activity picked up in recent quarters." The decision was unanimous among the Fed's 10 voting members, and seems to indicate officials aren't too concerned about a weak December jobs report. The report showed hiring slowed suddenly, with businesses adding only 74,000 jobs that month, down from an average of 205,000 jobs in each of the prior three months. "Labor market indicators were mixed but on balance showed further improvement," the Fed said. Some economists were surprised the Fed didn't mention turmoil in some emerging economies. Emerging market currencies including Turkey's lira, Brazil's real, India's rupee, Indonesia's rupiah and South Africa's rand have recently fallen rapidly, as investors have pulled money from the countries. Wall Street has even nicknamed those nations the "Fragile Five," given the volatility. "The wobbles in global markets did not materially affect the Fed's outlook and the policy course is steady as she goes for now," said Julia Coronado, chief North American economist for BNP Paribas. Economists are hoping for more encouraging U.S. news from a Commerce Department report Thursday morning, which is expected to show the country's gross domestic product grew at a 3% to 4% rate in the fourth quarter of 2013. 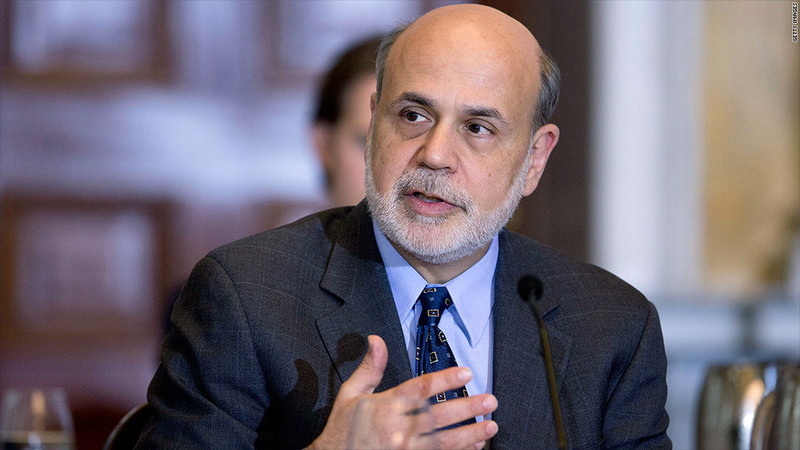 This week marked Bernanke's last as chairman of the central bank, after serving eight years in the position. Originally appointed by President George W. Bush in 2006, Bernanke's tenure coincided with the deepest U.S. recession since the Great Depression. His peers credit him with aiding the economy and preventing an even deeper recession. His critics worry, however, about the future consequences of the central bank's massive stimulus program. Current Vice Chair Janet Yellen is scheduled to take the helm, and will preside over the next Fed meeting in March.